Stoves were the inspiration for these Going Lighter pieces. 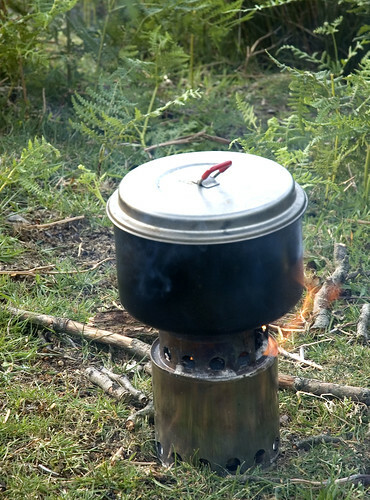 More specifically, it was a number of the stoves seen on the TGO Challenge that got me going. There are still people walking the Challenge who are carrying Trangia stoves – the whole set; some of them are amongst the nicest people I’ve met on the Challenge. To be fair, they all have their reasons. Some people feel that these stoves are very efficient when it comes to fuel. Others site the Trangia’s ability to cope with wind. But, my goodness, aren’t these heavy! I’m not sure what the traditional Trangia weighed but the current website offer a new, “Ultralight and Trangia Ultralight Hardanodized” set, made out of aluminium. This lightweight set weighs 720 grams! And many people on the Challenge use the additional gas converter on top. And, of course, they have to add fuel on top off that. My guess is that – for much of their walk – these Trangia users are carrying the best part of 1 kilogram just for their stove. We can clearly go lighter than this. But, perhaps, for this piece we ought to look at those issues that are sited as reasons why walkers stick with the Trangia sytem. This is one gear area where the backpacker will usually have a range of stoves to choose from. Backpacking in different areas may demand different strategies if, say, gas canisters are not easily available. These days there are good alternatives if yo are hiking where wood is easily found. And a quick – and light – overnighter may require little fuel at all and this may suit another system completely. So, how light can we go? What are the choices? And what is the route map? One of my all-time favourite stoves is my MSR Dragonfly. This multi fuel stove can run on anything from white gas and diesel, to rocket fuel. I’ve not used it with rocket fuel and so I can’t pass comment on how effective it is as a backpacking fuel, but I have used it with diesel and various grades of ‘dirty’ white gas, even a couple of times with the fluid that is used for dry cleaning. The most you get is a smell and some un-sightly soot, but the stoves do work using these dirty fuels. I’ve often carried this stove in areas such as the Pyrenees where it can be difficult to find canisters. This is a great stove, but shouldn’t be a first choice for backpacking. The Dragonfly weighs 330 grams and needs to be used with a fuel bottle (975 ml – 214 grams) and a windshield (46 grams) and often with an aluminium foil base (18 grams). That weighs in at over 600 grams -and that’s before any fuel has been added. The MSR Whisperlight (not quite as versatile as the Dragonfly) is only 60 grams or so lighter. So, the Dragonfly may well find its way into a lightweight backpacker’s load – under certain conditions) but for most trips – and certainly our ‘reference’ hike, it is way too heavy. Mind you, when car camping – especially in the winter – there is nothing better. As well as Trangias you can see a lot of Dragonflys and Whiserplites on the Challenge. So where should we go next? These days these are the probably the entry point for most backpackers – on our kind of ‘reference tip’ There are many types, including those where the stove sits away from the pot, feeding a burner through a tube; this makes for a low and stable load. But these systems are quite heavy too. There are now many, mini, stoves that simply screw into the top of a canister, and which weigh in at between 90 and 100 grams. These should be the entry point for lightweight hikers. These stoves may not be as stable as those above but with care you shouldn’t have any problems with them. These stoves are also susceptible to wind and a windshield can be crucial. Canister stoves come with warnings about not using windshields but, in reality, these are fine provided there is a reasonable gap between the stove and the shield. You can use an standard MSR foil windshield but backpackinglight.co.uk have a better option – they sell an aluminium kit that can be cut to size, allowing you to have a higher shield, which is very useful. When backpacking with a tent – an Akto or Superlight Solo – I always cook in the vestibule and so a windshield is not so critical. This is clearly a lighter option, but just how much lighter is it? My Peak Ignition stove comes in at 94 grams. To that I have to add a Swiss fire tool (39 grams) as the self-ignition system often doesn’t work when damp. Some of these tiny stoves – such as the Vargo stove – don’t have ignition systems at all. And for a two week backpacking trip I’ll carry two gas canisters (just in case) which – at their heaviest – weigh, jointly, 760 grams. So, my lightweight canister system – at its heaviest – will weigh in at a total of 894 grams. Obviously you can cut out one of the gas canisters by planning re-supplies, and the weight will fall significantly as you walk. it’s a light but not quite as light as one might think. Not all alcohol stoves have to be like Trangias. There are now a whole series of diminutive alcohol stoves on the market that offer dramatic weight savings. And these tiny stoves are excellent performers as well. In the US there are many tiny manufacturers producing stoves out of pepsi cans; some people in the UK have made similar stoves as well. But – for those of us who don’t really want to make our own stove – there are now some excellent, super-light, stoves available in the UK. I have two alcohol stoves. The first is the Vargo Triad stove, an amazingly small stove made of titanium. The triad weighs in at just 24 grams! And it is designed so that you can flip it over so that the base becomes a platform for an Esbit cube (a tiny, solid fuel pellet a bit like a backpacking fire-lighter). You will need a windshield for the Vargo, but we’re talking of only a few grams here. My other alcohol stove is the Whitebox stove that is available in the UK through backpackinglight.co.uk. This stove weighs a little more than the Vargo but it is still only 30 grams in weight. But the performance of the Whitebox is quite stunning. It provides a really fierce heat which boils up a litre of water in next to no time. Both the Vargo and the Whitebox stoves have their fans. With the Vargo you can extinguish the flame easily and pour back unused fuel into your fuel bottle. On the downside, it can be difficult to fill and – when cold – to light. The Whitebox is very easy to fill and, indeed, with just a little experience you realise that you can often boil water in your container without using a full load of fuel (as indicated in the manual). Either way, both of these stoves are very economical and use tiny amounts of alcohol. 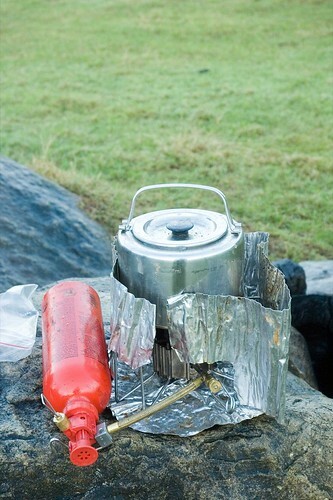 For me, the Whitebox is the better stove and it comes complete with a high quality windshield and foil base (34 grams). The foil used here is of a non-sharp variety. Another stove that is easily available here these days – and which has received really good reviews – is the Trail Designs Caldera Stove. This comes with an ingenious, cone-shaped, windshield. The windshield’s wide base means that this is a very stable system. The total weight of the system – available through Winwood Outdoor – is 57 grams. So, these are featherlite stoves. They are amazingly light and efficient over short trips. With only a little use you can easily work out how much fuel you need to take. For example, planning an overnighter you may work out that you only need to light the fire three or four times and you can then measure out that much alcohol into a lightweight container. But the alcohol stove is also useful on longer treks. Backpackinglight.com online magazine (a subscription only service but one that is great value for money) recently conducted a long and scientific comparison of different lightweight stove systems using a variety of fuels. They concluded that the alcohol systems were the most efficient and the lightest overall. Where these stoves fall down is that they do not have the ability to simmer. But the pot cozy system really makes a big difference. Bring your food to boil and then simply wrap it in the cozy and wait as the food warms through – it will remain piping hot for 30 minutes and longer. Pot cozys come with some designs but backpackinglight.co.uk sell a simple, cheap kit, that is very efficient. This final option is my favourite, it is the backpacking, wood-burning stove. There are various stoves on the market although many of them have to be imported. My fall-time favourite stove is the Bushbuddy Ultralight which is an amazingly designed stove that can be bought direct from its Canadian producer or through Backpackinglight.com. My Bushbuddy weighs 140 grams. While this is not quite as light as the other stoves, remember that the fuel is free, can be gathered on the ground and doesn’t need to be carried with you. Other posts on this blog have dealt with this in some depth, but it is amazing just how much free fuel is out there, even above the treeline. And if you’re really stuck for fuel, simply keep a stuff-sack handy and fill up with some wood as you go. 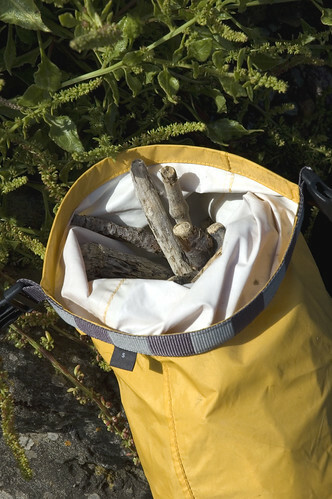 Dry wood is very light – 40 grams (wood and stuffsack) should see you OK for a day and, perhaps, even longer. If wood is very scarce you can use a pot cozy system to make this incredibly efficient system, even more efficient. Small stuff-sack – full this equates to probably two or three days worth of fuel. The Bushbudddy also gives you the satisfaction of using a real, wood stove. And where wood is fairly easy to find you can simmer away for ages. The smoke keeps away the midges! So, there are really useful lightweight options here that can save you a tremendous amount of weight as you walk. The alcohol stoves can be used in a large vestibule, say of an Akto. I reckon I could also use the Bushbuddy under there, with the door open for extra safety (I haven’t done this yet though, although I have used it under a tarp). At 140 grams – plus windshield at 30 grams – the Bushbuddy user can be saving over 700 grams on a canister system, let alone a Triangia! For shorter trips the alcohol stoves offer even greater weight savings. And for longer trips – where canister supply may be un-reliable – they are still very effective and very weight effficient. I hope this helps. This is a great area in which to loose weight. The Bushbuddy is an expensive item, but the tiny alcohol stoves are very affordable. For those wanting to know even more about comparative systems, Roman Acyl’s Lighthiker Blog (see sidebar links) has gone into this in remarkable depth. One thing you should mention is the issue of Carbon Monoxide. If you go to http://www.backpackinglight.com, you can see a 5 part series on the dangers. Not wishing to over dramatise, but if youâ€™re thinking of cooking in an enclosed space (i.e. in an enclosed porch), then you should read these articles (the full articles are available only to subscribers). I have to say some of the levels of Carbon Monoxide given off by some stoves are shocking (MSR are redesigning their Reactor stove because of this issue). Most stoves give off unacceptably large quantities of CO. Personally, Iâ€™ve changed to a Snow Peak GTS 100 because of this issue. Be aware that alcohol stoves are generally very poor in this regard. Most of the time this will not be an issue as an open tent door is easily enough ventilation. However, in heavy rain and in snow, be very careful to have enough ventilation. Personally, I would be wary about using anything other than a low emission stove with the tent door closed. Good points – mind you having enough ventilation has never really been a problem in the Highlands. My other backpacking haunts allow me to cook in the open air! Big fan of the caldera cone,also have the new primus micron 2.5 ti,have been converted to alcohol for short trips,i couldnt get my base weight down to 2.5kg without using it. What about esbit stoves Andy? Fancy a stove that weights 17g complete (including a full windscreen) is totally stable on any surface (unlike some meths & gas stoves) and boils 450ml of water using just 12g fuel, yet costs less than Â£5.00? A well designed esbit stove can do all that. I will probably bring mine on our Wales trip in a couple of weeks and see if I can convert you! OK the Bushbuddyâ€™s my favourite stove but for trips of a week or so esbit is unbeatable. Actually, Colin there is something here. The Pot Cozy system will completely revolutionise Esbit stoves! There may be some editing needed – although I did point out the versatility of the Triad! Interesting article. I have used petrol, gas and other stoves but must admit to being a Trangia fan. There is something about its silent operation that I love…the way it does not distract from enjoying the wilderness. I remember at the end of a long day walking up the Lairig Ghru to climb Braeriach camping near Loch Einich and putting the Trangia on for a brew…I was so tired I fell asleep and was only woken with the tent beginning to fill with steam. But you might want to try one of the tiny alcohol stoves – they’re silent too! I’d love to get a bushbuddy ultra, but am wary of import duties to the UK if I purchase from US or Canada. Has anyone any experience of whether these get hit with duty? Or any rumblings of a UK supplier? Thanks! For some reason I didn’t get charged duty at all on my Bushbuddy; I just turned up at the depot and signed for it! This is quite unusual so there must be some reason for it. 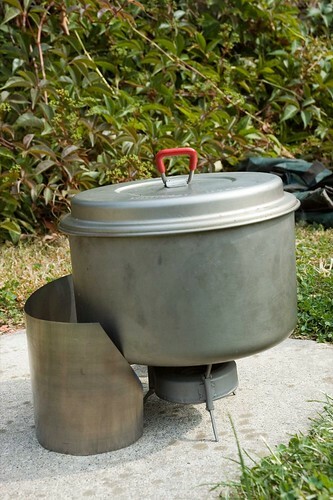 good article but surely when comparing wieght you must compare liuke for like , the trangia is a cooking system with all you need except fuel ,so a similar system of stove pans and windshield must be compared as a complete set . The fuel wieght and amount required is another thing that has also to be taken into consideration . Ian â€” that’s true but thesse lightweight systems are still much lighter than the Trangiaâ€” system to system as it were. Generally I am not worried about speed either! after all we’re not talking about that much difference in the big scheme of things!